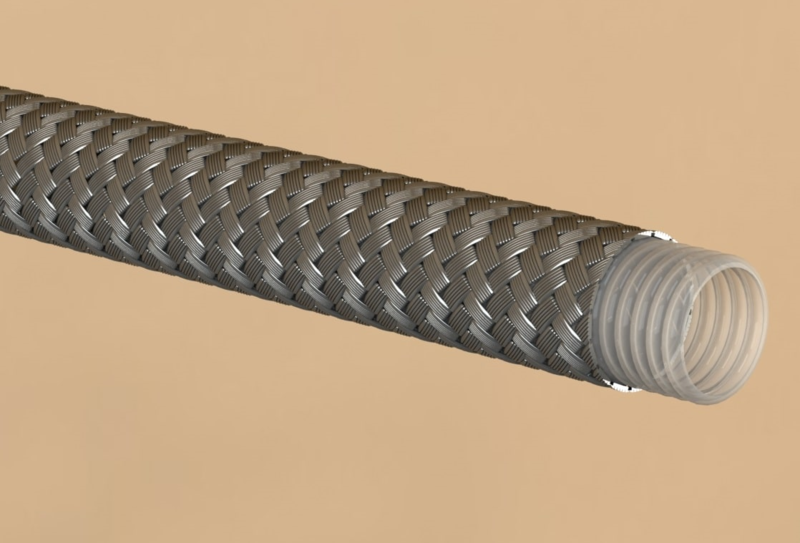 Select our convoluted-bore, heavy wall PTFE hose with braided stainless steel reinforcement for greater flexibility: true inner diameter – I.D. sizes of 1/2″ up to 2″. The PTFE hose core is a helical convolution, or a single, continuous corrugation throughout the PTFE hose core, allowing the hose to drain completely. When better flow rates are desired, select our B-Flex PTFE hose or sanitary ST-Flex PTFE hose. Let us fabricate your C-Flex PTFE hose assemblies at our manufacturing facility by selecting from our hose fittings, standard in 316L stainless steel with other fitting materials available. Our crimp collars for these hose assemblies are made from 304 stainless steel. If you are in need of bulk hose, purchase C-Flex PTFE hose in bulk lengths starting at 50 feet along with hose bulk fittings and crimp collars. Be sure to check specifications for the type of hose you require for your process – Please see below for detailed specifications. ; these include: temperature ratings, working pressure, burst pressure and minimum bend radius. You can use our Chemical Compatibility Tool as a guide to ensure PTFE hose is okay to use for your chemical transfer. If you are still uncertain as to the specific hose, fitting type or you require a customized solution, Email us: sales@flexfithose.com or call us: 410-327-0758.